Say goodbye to writer's block. Unblock makes writing easy, with professionally designed writing exercises to get you through even the toughest obstacles. 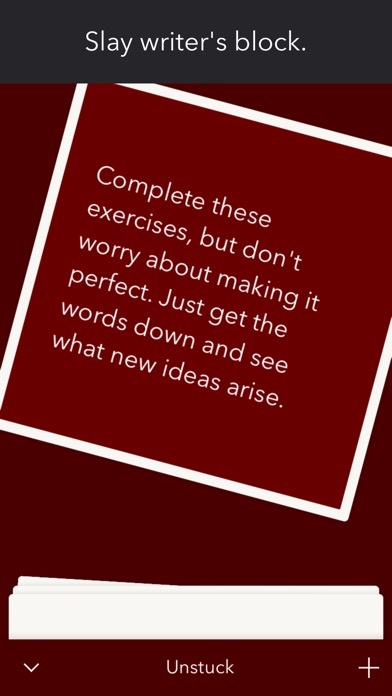 With Unblock you have access to hundreds of writing prompts, exercises, questions and quotes that will help you: - Get through writer's block - Discover what kind of writer you are - Develop your writing skills - Get inspired to write - Bring your characters to life - Spark your muse Unblock is a project by Werdsmith. Please note: exercises in Unblock are grouped into decks of cards, which you can unlock by purchasing credits in the app. We've given you a bunch of credits for free to get you started. I am an aspiring writer, and in writing my first book, I was kind of clueless. I tried many apps to help me with outlines and ideas, even to help with writers block, but NOTHING compared to this. 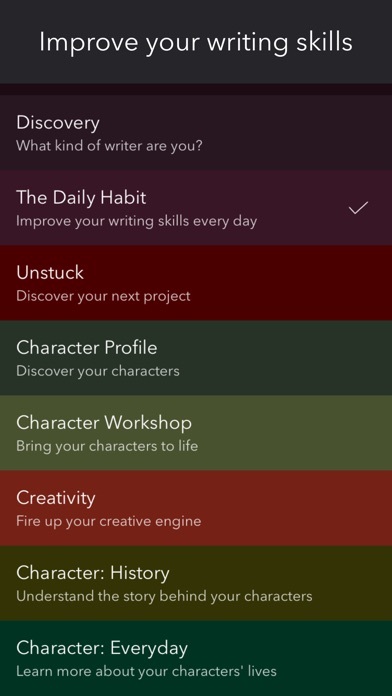 This is the best writing app I have ever used and it has helped me come up with tons of new ideas for my story and I MUST incorporate them into it ASAP. THAT’S HOW GOOD THIS IS. GET THIS APP RIGHT NOW. This app has a lot of great potential and is one I’d love to explore. However, the app makes it impossible to do so. Say I’m an author, that’s my job. But my books aren’t selling like crazy so I turn to this app thinking it’s cheap and helpful with getting the ideas flowing. Then, upon opening it, I find that I get two card sets and the rest I have to spend money I DON’T have on an app I thought was free. I understand the developer must make money himself, but more card sets should be available from the beginning. Say for example, the main feature of this app, The Daily Habit. It’s on the AppStore page and mentioned in the description. If nothing else, shouldn’t this be free? Like I said, this is a beautiful app and it’s one that I wish I had the funds to use correctly. The coins should be able to be earned. 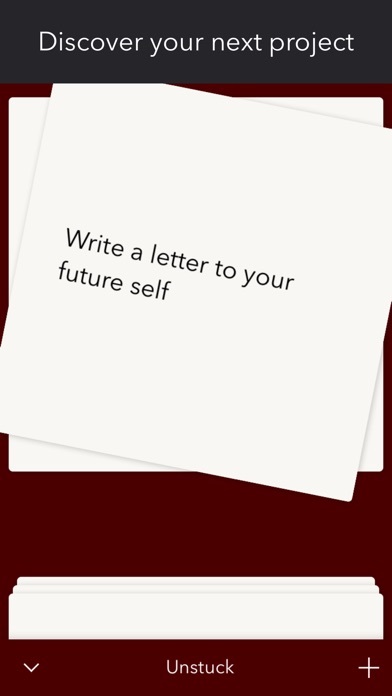 Say, for example, every time you complete a Daily Habit you get 5 coins. This would make the process slow, but not impossible and the un-patient people will go straight for the option to purchase coins. I truly wish I could’ve enjoyed this app more, but the system displayed is impossible for my budget. Fix this issue and you’ll have a loyal follower. I’ve had this app for a while but really haven’t used it until now.First off, the prompts on it are really good which is why it did get 2 stars.But the fact that there is no way to get credits without buying them makes no sense unless they’re just trying to get all of your money. There should be a way to get credits without buying them. (Updated) ... but I learned long ago not to purchase IAP credits to unlock features in an app. You can't restore them. So if you buy a lot of credits, then need to switch phones, you are out the packs that you bought with those credits. Please correct me if I'm wrong: things may have changed. Offer a full unlock, or even packs of cards that can be restored, and I will certainly take another look at what this app has to offer. It seems interesting, but I'm not going to get burned again. —  It’s interesting that the dev still updates the app, yet totally ignores all of the complaints about the monetization scheme. IAP currency is horrible for anything that is supposed to last. Offering no way to earn “coins” without buying them makes no sense, unless the goal is to force your customers to re-buy everything later on if they upgrade/replace their phone, or have to reinstall the app for any reason. If they were to sell the additional card sets for actual money so they could be restored, or offer groups of card packs for sale – like $10-15 for “full access” – I would buy them. No question. I will not support this form of IAP. Ever. You're blocked by an instant paywall as soon as you start using this app to unlock the features it was made for and you downloaded it for in the first place. Scummy business practices, stay away. this would be super useful if there was a way to earn "star coins" besides just buying them. or, even better, if you got rid of the star coins and just gave us the stuff for free, like your app advertised... i would much rather sit through ads then have to pay for something that is advertised as free. I like the concept of this app, but the fact that you have to spend money on it without other choices is disappointing. If anything I would suggest being able to watch an advertisement for 5 or so star coins, or even a daily bonus system would work. The 30 (-10) star coins they give you at the start isn't enough to buy the pack they described the whole app about. Ironic much? 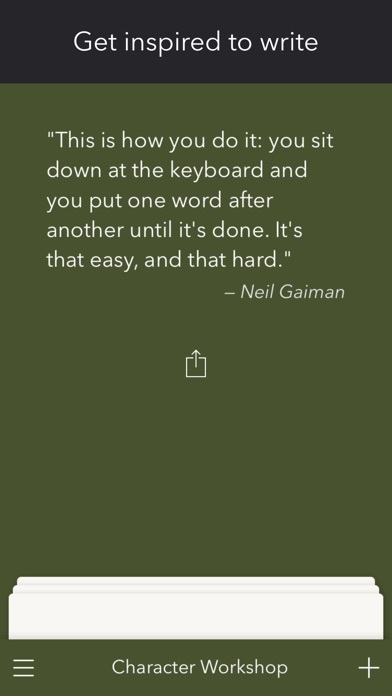 Very useful app for writers! This is a great way to make sparks fly in your brain, real inspiration and ideas for brainstorming. I don't mind supporting developers; there's a huge amount of time and energy to create these things, and if you don't support the creators they will have no incentive (or economy) to make or update things in the future. This app can really be applied for more than just writing. I'm also using it to focus and create ideas for my photo art projects. Very attractive app, too. I would much rather sit through ads than be forced to buy "star coins" to unlock the feature for which I downloaded this app to begin with. They give you 30 coins. Then force you to buy their basic "What kind of writer are you?" package for 10. Well, now that you've slogged through that waste of time, the "beating writers block" bundle (the one this entire app description implies this whole app is about) is 30 coins in and of itself. If you're in my situation, where you are just stuck while writing, don't expect this seemingly free app to help without a price.